The largest number of historical working windmills in the Netherlands can be seen at Kinderdijk near Rotterdam and Dordrecht in South Holland. Admission is free. Kinderdijk near Rotterdam and Dordrecht in South Holland has the largest collection of historical working windmills in the Netherlands. The 19 windmills (windmolen) at Kinderdijk are on the UNESCO World Cultural Heritage list and a very popular day-trip destination from Rotterdam and even Amsterdam. Public transportation is available but most visitors find bus tours and minibus excursions more convenient, especially when traveling from Amsterdam or seeing Kinderdijk en route to Belgium. Kinderdijk is the best place in Holland to see working windmills. The 19 windmills of Kinderdijk form an idealistic panorama of historic rural Holland as it was a century or two ago. In contrast to most other open air museums with windmills in the Netherlands, the windmills at Kinderdijk have always been here and were not brought to Kinderdijk as museum exhibits. The windmills at Kinderdijk date from the eighteenth century. These windmills were watermills – wind-powered mills used to pump water from low-lying land back into the Lek River. Steam-powered pumps took over in the late nineteenth century (and eventually electricity) but the windmills were still operational in emergencies up to the mid-twentieth century. Admission to Kinderdijk is gratis and the windmill area is freely accessible at any time. The best time to visit is on Saturdays in July and August when all mills are working if sufficient wind is blowing. The Bezoekmolen (Visitor’s Mill) is generally the only windmill open to visitors at Kinderdijk. This mill is open daily from March to late October and generally working on these days if wind is blowing strong enough. The Kinderdijk Bezoekmolen mill is also open on most weekends during the winter period. The windmills at Kinderdijk can be admired from paths along the canal that are open to pedestrians and bicycles. Bicycles may be rented by the hour onsite and, as most of Holland, inclines are not a problem. From April to September, pleasure boat rides can be enjoyed to see the Kinderdijk windmills from water. See Cycling at Kinderdijk for more detailed information. Windmills are emblematic of rural Holland and the typical rural idyll of the Netherlands branded into may tourists and visitors minds. 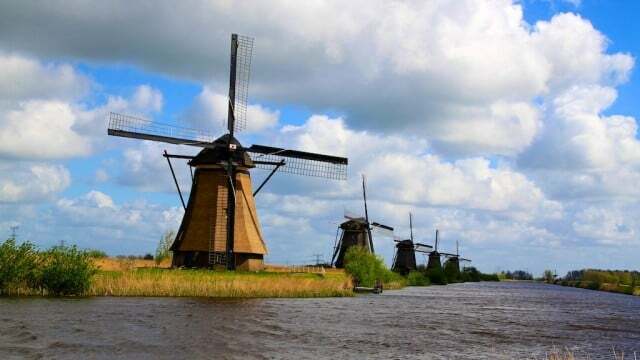 Thus it is not surprising that Kinderdijk is exceptionally popular with bus parties – Kinderdijk simply is the best place to see windmills in Holland. Early mornings or late afternoons usually see a respite from the tourist masses. Getting to Kinderdijk is easy by car but detailed maps (or GPS navigation systems) are useful as small country roads are needed to reach the windmills. A car ferry service transports cars, cyclists, and pedestrians from Krimpen aan den Lek over the river very close to Kinderdijk. Parking is usually charged for (€5) and include a souvenir map. Kinderdijk can easier be reached on public transportation from Rotterdam or Utrecht. Direct buses – Lijn 90 – run mostly hourly in 52 minutes from Rotterdam-Zuidplein to Kinderdijk (stop Molenkaade) and continue to Utrecht Central station, a further 90-minute bus ride. Many different bus tours and minibus day-trip excursion trips are available from most parts of the Netherlands to Kinderdijk. Rotterdam is the closest big city to Kinderdijk but day-trips from Amsterdam are easily arranged too. From April to early October, three-hour return boat excursions can be enjoyed from Rotterdam to Kinderdijk. Kinderdijk has the finest collection of working windmills in the Netherlands. It is a popular day-trip destination especially from South Holland cities such as Rotterdam and Den Haag (The Hague). 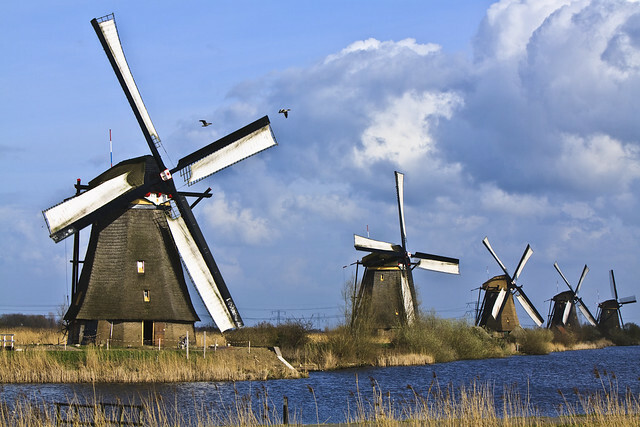 Day-trips are also available from Amsterdam but solo travelers may find the historical windmills at Zaanse Schans easier to reach by public transportation from Amsterdam. Book boat excursions from Rotterdam to Kinderdijk.